Loon Rescue — Raptor Education Group, Inc. It has been a busy few days that presented some very difficult cases.
.;A sweet young female loon from Squaw Lake got into serious trouble this week. She somehow got a fishing lure, complete with spoon hooked into her face and mouth. 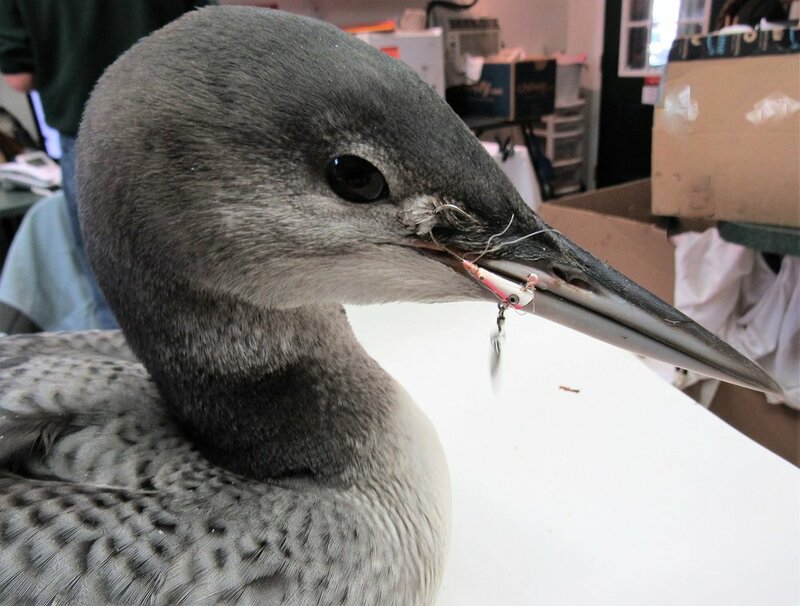 The attached monofilament line was wound tight around her beak and a significant amount of line was down her throat into her digestive system. She was unable to open her mouth. The hook securing her beak in a closed position. The young loon was unable to eat or drink. Due to the loons emaciated body condition and history from the lake residents the lure was likely on the loon for a week. Lake residents Sam Spohn and Erin Kalata called for help and then assisted REGI’s loon rescue extraordinaire Linda Grenzer in the capture of the seriously injured young loon. Removing the hook was challenging as it was stainless steel. Stainless steel hooks are great for fishing, but the barb cannot be removed with regular wire cutters. The hook embedded in her face, near her eye which added to the urgency and level of difficulty in its removal. Once the hook and line were removed from her beak, we were finally able to see into her mouth and quickly realized that a great deal of line was in her digestive system. We were able to remove the line without incident. The loon was lethargic and weighed in at only 3 lbs. We tube fed the loon and started both antibiotics and an anti-fungal in hopes of heading off aspergillosis which plagues loons and other avian species with compromised immune systems. We are elated that she is eating well not on her own. Her condition remains guarded, but she is active and eating. That gives us hope. As I write this post we have had an update. X-rays were taken at the Antigo Veterinary Clinic this morning. Dr Sarah found a large hook in the loon’s gizzard which is a part of the stomach where food is ground up. The gizzard contains stones which is how birds grind their food. The fact that the hook made its way that far into the digestive system without causing any tears is a minor miracle. We are hoping it stays where it is, and the loon can continue to recover. This hook is different than the lure and hook. We may be looking at two different incidences of the loon contacting fishing hooks. Our patients cannot talk, but we track their stories through body condition, behavior as well as how they are present in our clinic. Sometimes it is clear such as a lure hooked into the bird’s face, other times the x-rays help us piece together the story. This young patient is only a few months old but has been through a great deal already. We are working hard for a full recovery and hope this is just a blip in her history. Thanks to everyone that was involved in getting help for this loon. Everyone can help prevent such injuries by collecting discarded fishing line and lures left along the sides of lakes or bodies of water. It is an easy thing that prevents serious trouble and slow death for wildlife that get caught up in it. Thank you in advance for your efforts. I will include a photo of discarded fishing line that I took when I released the Pied-billed Grebe. You can see how it blends into the surrounding shoreline. PLEASE do your part to help. A fishing lure/spoon and hook was embedding into this 9 week old loons face and beak. Line was wrapped tightly around her beak and entended down her throat into her digestive system. Calming a very stressed patient is important to its survival. This 9 week old young loon is about as emaciated as we have ever admitted. After it was done. Line and lure on the table. Laura Sánchez tube feeds the young loon after the hook was removed. The loon also received antibiotics and anti-fungals. She is fishing and self feeding!! You can see the large hook in the loons gizzard area of her stomach. The rocks are natural in the gizzard to aid digestion. Thanks Dr Sarah and Antigo Veterinary Clinic for their help. Linda Kevin Grenzer arriving at REGI with the loon. Linda Kevin Grenzer immediately after the capture of the young loon. Thanks for the great assist in capturing the loon Erin Kalata. You can see how fishing line blends into the shore line and is easy for wildlife to contact and get tangled in.